When was your last deadlift PR? What was your last time on “Helen”? Who coached you? How much sleep did you get the night before? If you are serious about your progress as an athlete, you should be keeping a training log. A log is an effective tool for tracking your athletic progress. Not only will it help you stay motivated, you’ll be stronger and faster for your efforts. You can only improve upon what you have measured and there’s no better motivator than chasing after a new PR. Start your log today and within a month you will have a solid baseline of your athletic capacity. Look at your lifts and times, you should have a very good idea of what your weaknesses are as an athlete. If you aren’t sure, ask one of the coaches. From there, set some goals for yourself. Whether its adding 10 pounds to your back squat or shaving 10 seconds off your Fran time, write it down in your log and we will help you achieve it. 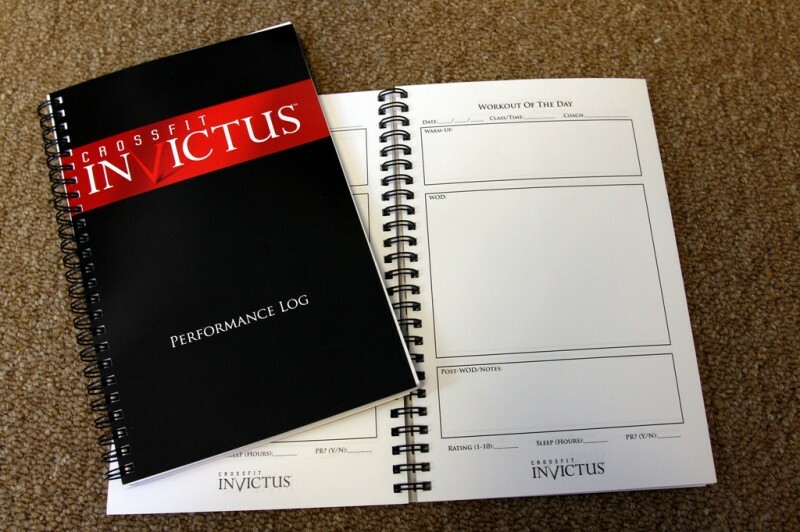 Your coaches at CrossFit Invictus have designed a log specifically for your needs. This spiral-bound log contains pages for recording benchmark times on WODs as well as PRs on your lifts. Each daily entry page contains a section for the warm-up, WOD, cool-down, and other important factors such as when you trained and how much you slept. The reference section contains several resources including a kilogram to pound conversion table, strength standards for various lifts, and a convienent block chart for anyone following the Zone diet. It is a must-have for the CrossFit athlete and they are currently available for purchase at CrossFit Invictus.